MORE CUSTOM FEATURES THAN EVER BEFORE! Includes our standard CCM-6 brain box with 2 keychain remote control units (fobs) and built in 7.5amp fuse. This unit will allow you to control your Magical Wizards™ LEDs from up to 100 feet away with built in short circuit protection and an industry leading 3 year warranty. Remote has all standard functions including 7 different pre-programmed colors, 3 strobing patterns, 3 speeds of breathing, 3 speeds of color morphing, thousands of custom color choices and the ability to color morph while strobing. Brake Alert to change all Magical Wizards™ to solid red color when brake is activated, 7 Preset Functions of Solid Color Mode, Strobe Mode, Breathe Mode, Color Morph Mode, Random Color Flash Mode, Speed Level Adjustment, & Intensity Level Adjustment, and ability to adjust Color, Speed, and Intensity in any combination with easy to use app sliders. Battery Status Meter allows you to monitor battery voltage. Designate Custom Colors through the Color Mixer and Create your own Custom Sequence. Then try out the Musical Interface, sync to your phone's music library and watch your Wizards dance to your music. 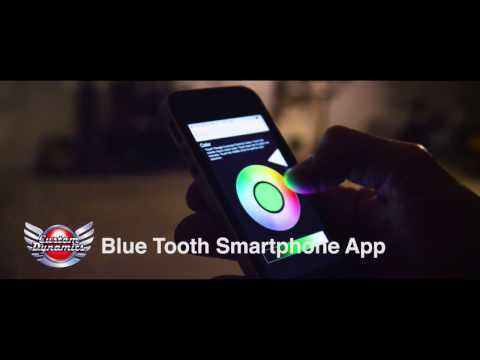 Works with Custom Dynamics® color changing Magical WIzards™ LEDs only.